The great wines are finally ready to taste after five decades at the winery by the Coco Farm vineyard. This grape farm made on the slope of the mountain by people in "Kokoromi-Gakuen" which is an educational institution for the intellectually handicapped. I drank sparkling wine with Mr. Minoru Kawada, who is the chairman of the Kokiromi-Gakuen, and his daughter Mrs. Chieko Ikegami, who manages the winery at the top of the grape farm hill. Our dream was to someday put a flag on the hill. 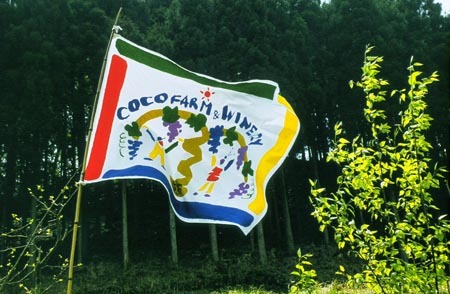 The wine of the Coco Farm Winery was presented at the Okinawa Summit's Banquet for the VIPs in 2000. Sommelier Mr.Masaya Tazaki recommended this wine after he spent a year trying to find a wine from all of the domestic wines. They decided to make a flag because that year was also Kokoromi-Gakuen's 50th anniversary. A toast to the people who tackled the task of brewing wine with the rhythm of the mother nature! !